In a large skillet, cook sausage over medium heat, breaking up with a wooden spoon, for 10 to 12 minutes or until cooked through. In a large pot, bring 4 to 6 quarts of water to a rolling boil; add salt to taste and the pasta; stir gently. Cook pasta according to package directions, adding broccoli for the last 2 to 3 minutes of cooking. Remove from heat and drain well. Meanwhile, in a small saucepan, heat pesto over medium-low heat until heated through; toss with pasta. Add the sausage to the pasta along with the mozzarella cheese. To serve, garnish with fresh basil leaves, if desired. 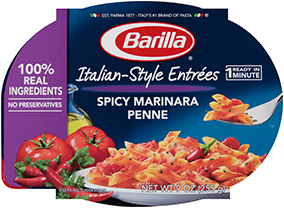 Customize it: Vary this simple dinner with cauliflower or peas instead of broccoli, or Barilla Marinara sauce rather than Basil Pesto.